Today I want to show you a new tool that we published recently onsite: the SEO calculator. How much should I expect to pay for SEO? Let’s talk about some of the answers it generates and some of the objections I have heard raised (other than that it doesn’t work on mobile, which that fix is in progress). Also, don’t forget to cross reference it with our average SEO hourly rates and digital marketing industry pricing survey publications. And if you think the price given is wrong, please email your objections to hello@getcredo.com. Sometimes the calculator will spit out a number that seems incredibly high for the business that you have. the calculator will say that you should expect to pay (plus or minus 20%) $1,725 per month for SEO help. “Over 12 months that’s more than my whole year revenue!” you’ll say. Guess what? Then maybe you can’t afford to hire someone to help you with SEO yet. You should dig in, learn some SEO yourself (start here), get your revenues up, and then look at bringing someone in to help you with SEO. Would you hire someone full time if you don’t have the revenues to pay for them? No? Then why would you try to hire a consultant that you can’t afford? 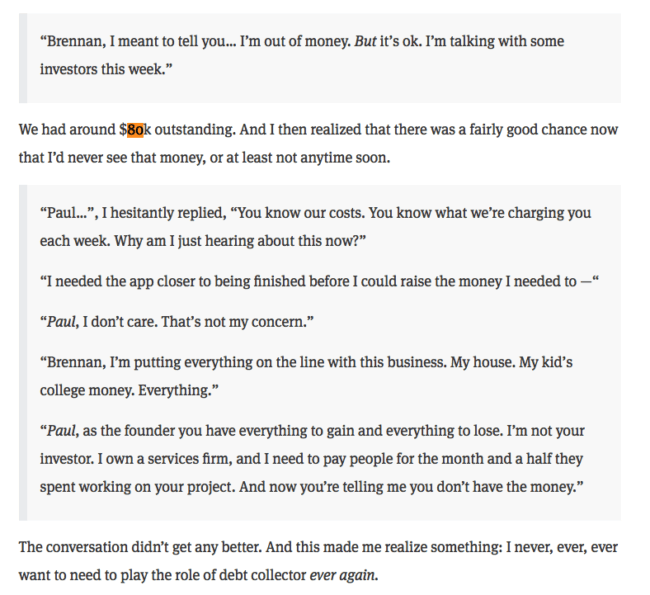 I hate hearing stories of consultants/agencies who didn’t get paid by a client. Pretty much every consultant or agency (myself included) has at least one story of this, and unfortunately most of us have more than that. Do not, I repeat do not, be that client. Why should I pay something different based on my revenue model? Why should you pay someone more to do a job that has a higher ability to positively affect your business? Do you pay your CFO (or yourself) more than you pay your receptionist? Same with working with a marketing agency/consultant. Competitive rate coupled with the value they bring to your organization. You have two people come in with pitch decks for ways to move your company forward. You have commissioned both of these. The first person shows you their presentation, which is not very polished design-wise. They are also not amazing at public speaking. But within the presentation they show you how they can make you an extra $2 million this year and it’s going to cost you $100,000. The second person gives their presentation, which is incredibly polished because it was done by a designer. They are also an accomplished public speaker. They show you how they will make you $1 million and it’s going to cost you $100,000. Now tell me. Which one would you choose? The reality is that some of you are going to choose person number 2 because they have a better designed presentation and speak more eloquently. Why should I pay more if my company is making more money than another company? If your business is making more money than another and you have a bigger potential upside as well as bigger growth potential, then it will cost you more because it costs more to move the needle on something you already have going. Unless your business is a perfect well-oiled machine, more revenue can usually mean more work to get things implemented and changed in order to meaningfully move the needle on your business. You’re paying for the value potential. 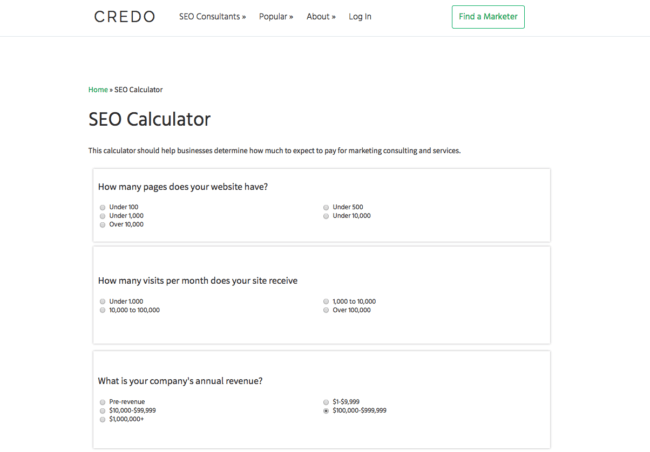 Check out the SEO calculator, and email us hello@getcredo.com if you have questions!